Mel Brooks doesn’t know how to waste time. He dives into his one-man show the second he has quieted the preemptive standing ovation (“At the end, if I’m good, we can do this part”) to launch into jokes about growing up in New York’s Borscht Belt. The story is corny and sincere, which those familiar with Brooks’ work will recognize as his preferred combination for jokes. Live At The Geffen stays unfailingly true to this standard throughout the hour. As the mind behind comedy classics like The Producers, Blazing Saddles, and Young Frankenstein, Brooks’ storytelling maintains the congenial and self-deprecating humor that marks those films. He has a warmth that makes the show feel like an intimate gathering, even as he stands onstage in a formal tuxedo, his voice echoing in the large Geffen theater as a pianist sits patiently behind him. Brooks says with a beaming smile that he used to call his audience “ladies and Jews,” and minutes later, does exactly that. It feels like a throwback—because it is, without apology. Brooks is an elder statesman of Jewish kvetch comedy, a relentless lover of puns, and an entertainer in the quickly dwindling vaudeville tradition. 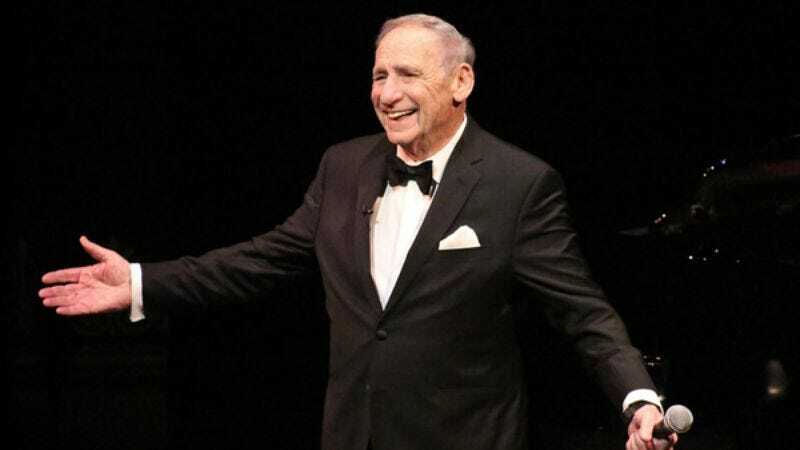 Mel Brooks Live At The Geffen feels like sitting with an old friend with a singular talent for steering the conversation, but it doesn’t come from a presumptuous place. Brooks is simply the funniest person in the room. While he has done sporadic gala performances over the years, this solo show is perhaps his most personal. Brooks spends the hour interweaving anecdotes about himself and his filmography with effortless elasticity; he has no notes, nor does he need them. There are stories about his childhood in Brooklyn, when a 9-year-old Melvin Kaminsky saw the performance of Anything Goes that inspired him to go into show business. The audience hears about Brooks’ time in the military, though he eschews tales of gore for dryly stating that he couldn’t go into show business “because Hitler started a war.” He dips into his time writing on Sid Caesar’s Your Show Of Shows, his marriage to Anne Bancroft, and the development of his beloved films. He sings songs from his extensive filmography, even slipping in a rousing rendition of a hilarious and sadly unused History Of The World: Part I B-side. Brooks’ voice is more weathered than when he first sang these odes to wordplay, but he is no less enthusiastic. He even entertains a round of questions shouted from the audience, though this section betrays that Live At The Geffen’s sound quality and editing work are only adequate. Throughout this medley of variety acts, Brooks proves that his capacity for cracking wise is boundless even as he approaches his 90s. Live At The Geffen is his very first one-man show, and it was taped when he was 86 years old. To say Brooks is sharp for his age, though, is to discount the fact that he is still one of our sharpest comedians, period. Aside from a brief intermission, the only thing approaching a pause in Brooks’ seamless storytelling act is when he has to blow his nose, and he even manages to make that into a joke. Interviews with his collaborators over the years—such as his lifelong friend Carl Reiner, who was in the audience for Live At The Geffen’s taping—have repeatedly revealed Brooks to be a constantly canny comedian who could find the joke in just about anything. His own stories are no different, whether he’s discussing his mother’s dreams of seeing the world or fielding joke pitches for his Alfred Hitchcock pastiche High Anxiety from Hitchcock himself. Brooks gets the best—and most revealing—laugh of the night while describing a walk through New York City with writer Neil Simon. When they see four nuns crossing the street, Simon’s wry response demonstrates that he knows as well as anyone that Brooks is incapable of letting a comedic premise pass him by. That could be exhausting in day-to-day life, but it’s perfect for something like an hour-long TV special. Brooks does not pine for the past, but sentiment defines the special. The audience is about as friendly as it gets, having paid to watch Mel Brooks discuss Mel Brooks. There are even a few times when a mention of a beloved movie or actor prompts a collective sigh of nostalgia. But anecdotes about famous people and behind-the-scenes happenings are not why Live At The Geffen succeeds. It succeeds because Brooks is a natural storyteller with a gift for making his audience feel like it’s in on the joke. 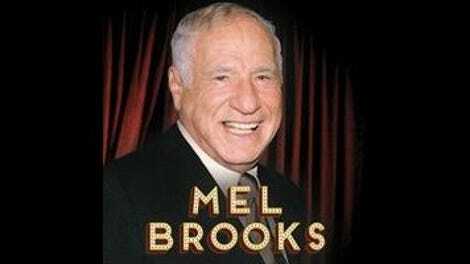 When Mel Brooks is onstage, the audience doesn’t just laugh; it smiles.